Replacement Coils for TRANE, CARRIER, MCQUAY, YORK, AMERICAN STANDARD, BRYANT, MARLO, WORTHNGTON and HALSTEAD MITCHELL replacement heating & cooling coils. We will design a replacement coil that meets all dimensional and performance criteria of the original and deliver it to you on your timetable. We will duplicate obsolete coils and as well as custom design coils for new applications. Standard and steam distributing. 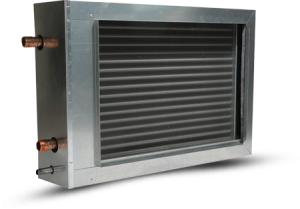 Applications include preheat, boosters, reheat, duct heaters, process air and gas heaters and more. With a minimum copper tube-wall thickness of 0.025″, to provide reliability in heating solutions for process and comfort applications. Additionally, there is a minimum clearance allowed for tubes to thermally expand and contract freely thereby eliminating the potential for tube failure at the endplates. 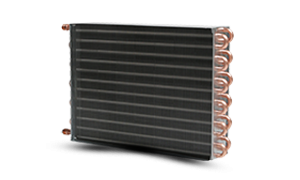 Our steam coil construction is designed to remove all of the latent heat to condensate steam and provide condensate removal, both key to optimum heat transfer. Cast Iron, Steel and Copper for Steam and Hot Water – most replacements available within 10 days or less. Customized element lengths available on request. 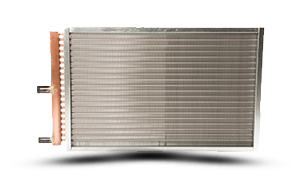 Suitable for use in a wide variety of HVAC air heating and cooling applications. Standard and custom designs are available for new and retrofit installations. Our software is ideally suited for accurately selecting hot water coils for air handlers and built up systems. Great care is used in selecting the optimum coil circuiting (feeds and passes), fin spacing, and materials of construction to reach the optimum coil selection for any set of operating conditions. 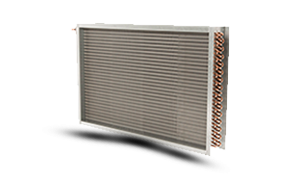 Our Condenser Coils are available with single or multiple circuiting for condensing or heat reclaim applications. 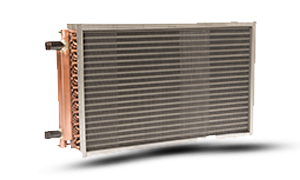 Whether your application requires a single refrigerant circuit, integral sub-cooler or multiple face-splits, we can design and build the precise refrigerant heat rejection coil for your application, making us a one stop shop for all of your Condenser Coil needs! 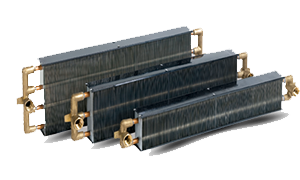 Our DX Evaporator coils offer various circuiting abilities as well as face-split and intertwined designs. 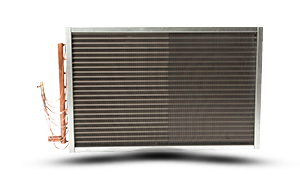 Custom Replacement Coils designs and produces custom DX evaporator coils as well as OEM replacement evaporator coils. Custom Replacement Coils is able to source a wide variety of heavy-duty coils that withstand the rigors of industrial applications. Providing high quality Industrial coils designed for easy maintenance, low operating costs, and longevity. With capabilities to design and build fluid coils for water, glycol, oil, and other liquids as well as refrigerant coils and steam coils for high pressures, we can meet all of your Industrial Coil requirements! While the HVAC and end use markets are key product distribution channels for our factory we also produce evaporator coils for the refrigerated case market servicing convenience stores and food markets. For installations that require a complete coil assembly our insulated case coils are an effective option that can reduce field labor costs in most cases.